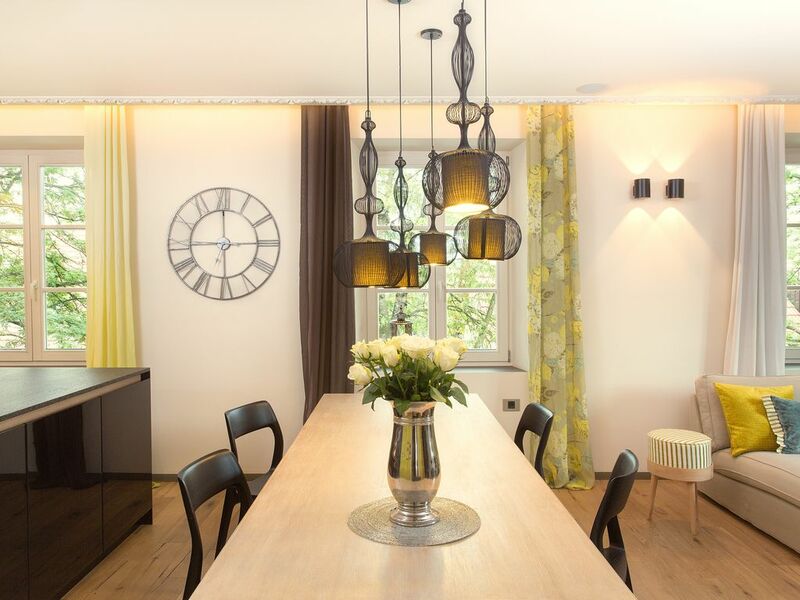 Home Sweet Home (75m2) is spacious, bright and cosy with so many stylish details. Designer's apartment is comfortable for families, charming for romantic couples and convenient for business travelers. Located in green and peaceful district walking distance to heart of Ljubljana city centre. Two sofas, chairs, television and fireplace from early 19th Century provide all you need to relax. Functional kitchen is part of living room to keep your stay social. It is fully equipped for all you needs with stove, dishwasher, oven and other kitchen appliances. Dining table is very comfortable and easily guests 6 people. Master bedroom hosts king size bed and is connected with bathroom and walk in closet. Bedroom has queen size bed with wardrobe and is connected with bathroom and walk in closet. Main bathroom with the bath is separated from other where are toilet, bidet and sink. Washing machine and clothes dryer are also there to use. For more comfort bed linen, towels, kitchen essentials, hairdryer, iron, soap, shampoo and lotion are supplied. Get connected with high-speed WiFi, led TV with IPTV with lots of programmes. Stay in safe district and building with private parking . Bus station is just 50 m away and bikes for rent are nearby as well. Everything needed to arrange your stay is just few steps away; supermarkets, bakeries, pharmacy, nice cafes, restaurants and market with organic products. fantastic apartment close to the city center! nicely done booklet with things to do while in Lubljana! a definite recommendation! and the owner Eva is very carering! Perfect location and very well appointed. Welcomed by Eva with a glass of wine who provided an overview of this well appointed flat and helpful recommendations for sight seeing! The restaurant next door was amazing- they actually created a Slovenian meal just for the four of us Canadians! Highly recommended! Perfect accommodation and a perfect host. Would go back and would recommend without hesitation. We have stayed in quite a few self catering properties over the years but Eva’s apartment is a standout example of really excellent accommodation. The apartment is beautiful and has everything you need to make your stay not only comfortable but also a real luxurious treat! The furniture in the living spaces and the fittings in the kitchen and bathrooms was top notch and everything worked and was immaculate. The location is great and an easy walk from the station (with heavy bags). It’s close to the town centre and also has lots of handy amenities on the door step. Eva is a fantastic host. She met us at the apartment and made us drinks and took the time to tell us all about the apartment and the city. She has also made her own guide book which was very useful and was filled with tips and things to do. Eva was so friendly and helpful and was always a text message away if we had a question. We can’t wait to go back!!! This apartment is just beautifully appointed, clean & has everything you need. It’s close to everything and has a book with all you need to know and do in Ljubljana. We stayed for 3 days and felt safe & secure. Only we didn’t think to ask if there was a left, and there isn’t so you have 52steps to go up to the 3 floor with heavy bags. But we still Would highly recommend staying.